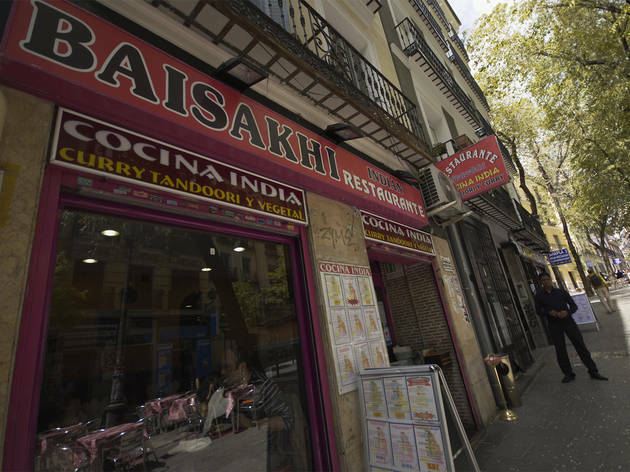 For good-value Indian food, Baisakhi is probably the best bet along what has become Madrid's answer to Brick Lane. The waiters all speak English, and the dishes on the menu include the old favourites, helpfully named in English. If you like a bit of poke in your curry, then be sure to ask for a spicier version of your chosen dish, as Spaniards don't generally like their food hot. This is the perfect place for a summer's evening, as the terrace is infinitely preferable to the slightly shabby interior. Very disappointing meal indeed. 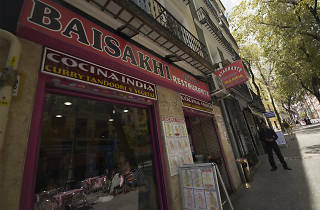 Having been to other Indian restaurants on the same street in Lavapies, we can definitely say that this is NOT the best. Service - The service was quite slow given the amount of people dining at the restaurant. However, the waiters were friendly once we had got their attention. First, the waiters bring you a POPPADOM (We were given ONE for 2 people) with two sauces. This is complimentary. Starters - We ordered ONION BHAJI and CHICKEN SOMASA - We got ONE of each on one plate with a very small amount of garnish (small slice of lemon, and a very small amount of shredded lettuce). These were nothing special but tasted okay. NEGATIVE Having eaten in many Indian Restaurants in the past in Madrid and in the UK, this was by far the worst Chicken Korma we have ever tasted. The sauce was lacking in colour, texture and taste. Instead of the creamy coconut sauce we are given to expect, this was a watery yellowy brown curry. NEGATIVE In our opinion, this did not look like or taste like Chicken Tikka Masala. It was watery, brown and lacking in taste. Positive - Despite this, there was a good quantity of chicken in both dishes. - The naan bread was hot and tasted as expected. DESSERT - Mango Lassi - This was disappointing. Instead of a nice thick yoghurty type drink, we were served with what tasted like a watered down milk shake. To make our experience even worse, the INDIAN restaurants on either side of us appeared to be serving better quality food at the same, or at a lower price.